News junkies and Facebook addicts take note: the new social-focused browser RockMelt just might be for you. After spending the day using RockMelt, I found the new Chromium-based browser to be a great way to keep tabs on my friends, family and favorite news sites and blogs throughout the day. RockMelt relies on two sidebars, called "Edges," that sit on the far right and left of your browser window. The one on the left is known as the Friend Edge and shows you a list of your Facebook friends that are online. The right side, called the App Edge, includes quick launch access to your favorite sites such as Twitter, Facebook, Google Docs, Pandora, news sites and blogs. Despite all that activity, however, RockMelt doesn't get in your way and lets you do your browsing in peace without hassling you every time a news source or social network gets an update. RockMelt is still in limited beta, you can sign up for the wait list here, so it's by no means a finished product yet. But here are a few first impressions of this new take on merging your favorite parts of the Web with your browser. RockMelt can get a little wonky with extensions, depending on which ones you use. Password manager, LastPass worked perfectly, but Instapaper, the extension that creates a text-only version of an article to read later, was a little shaky. Sometimes Instapaper would work perfectly, other times not so much. RockMelt's Edges are a great alternative to bulky persistent sidebars that can take away a big chunk of your Web browsing real estate. The Friend Edge displays your online Facebook friends using their profile pictures in a slim line down the left side of the window. The App Edge on the right uses each Website's favicon--the little icon you see in your browser tab when visiting each site. This is a vastly different approach from Flock (the original social Web browser) or Yoono, the social sidebar for Firefox. Both of those products rely on large sidebars that take up a sizeable chunk of your browser window. You can shrink down Flock and Yoono, of course, but the content inside the sidebar either doesn't resize or looks awkward in a sidebar smaller than the default size. This makes it much harder to view and access content, which kind of defeats the whole point of using a social-focused product. RockMelt still takes a bite out of the real estate for your main browser window, but it takes a much smaller chunk than Flock or Yoono while still being useful. What I really like about RockMelt is that its alert system doesn't get it my face. Whenever a news story pops up on one of my sites, or something gets added to my Facebook News Feed, the unread count just increases silently. If you'd prefer to have your browser scream at you more often, you can activate pop-up notifications. By default, however, RockMelt updates quietly and waits for me to be ready to view new content, not the other way around. The browser is still in its early stages, but RockMelt is not as customizable as it should be. I would like, for example, the ability to turn off the unread alerts on the App Edge on a case-by-case basis. Personally, I like to see alerts from my favorite news sources, but I don't need to know about unread tweets or Facebook News Feed items. I still like the convenience of having quick links to Facebook and Twitter, but it would be even better if I could control the alert system. 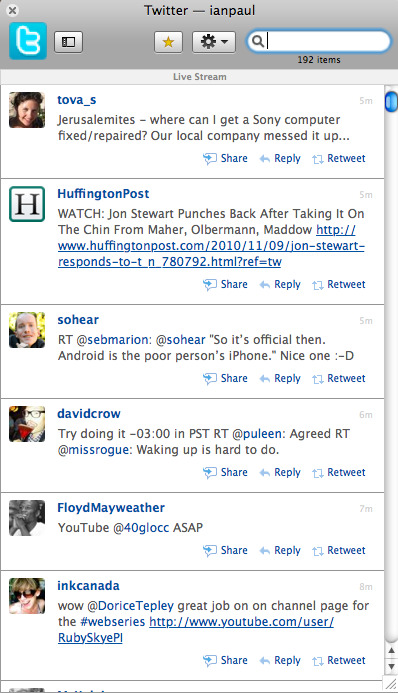 The strange thing about RockMelt's built-in mini Twitter client is that you can't use it to send out a new tweet. The Twitter client pops up in a little window when you click on the Twitter icon. You can read, retweet and reply to messages inside the window, but if you want to send out a new status update you have to click on your personal icon in the upper left corner of the browser window. That's a little counter-intuitive, not to mention annoying. It would be much better if you could update your Twitter status from within RockMelt's Twitter client as well as using the default status update option. Right now, the Friend Edge is a Facebook-only zone. I would like to see RockMelt expand that functionality so that I could include people from other services such as Google Talk, AIM and MSN Messenger. Facebook is a nice start for the Friend Edge, but I certainly hope it's not the end. If you want to give a try sign up for the wait list using your Facebook ID at RockMelt.com.